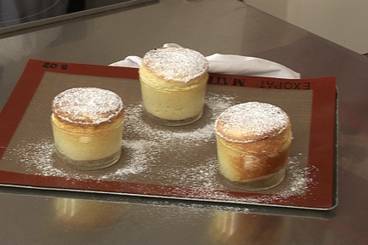 A light and delicate soufflé made with Grand Marnier - a delicious twist on a classic dessert! Make the crème pâtissière: cut the vanilla pod in half and scrape out the seeds. Place the split vanilla pod and seeds in a saucepan and add the milk. In a bowl, mix the 2 egg yolks with 50g sugar. Add the flour and 10g corn starch. Remove the vanilla pod from the boiling milk and the pour the milk over the egg yolk/sugar/flour mixture. Mix well then return to the pan and bring back to the boil, stirring constantly. Use an electric whisk to beat the egg whites until stiff. Add the 75g of sugar little by little. Take 240g of crème pâtissière and add 50g of egg yolks. Mix well then add 10g of corn starch and the Grand Marnier. Mix well then fold in a quarter of the meringue mixture. Gently fold this mixture into the rest of the meringue mixture. Butter your soufflé moulds using an upwards movement from top to bottom of the moulds (this will help the soufflé to rise). Sprinkle sugar onto the moulds then pour in the soufflé mixture. Transfer to the oven and bake for 8 minutes. Remove from the oven, dust with icing sugar and serve immediately.